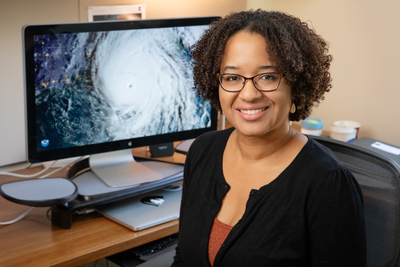 University of Illinois at Urbana-Champaign atmospheric sciences professor Deanna Hence discusses how some hurricanes become so large, the paths they take and how global climate change may affect these factors. What factors are required to cause a hurricane like Michael (and recently, Florence) to grow so large? Storms typically grow in size as they intensify, so the factors that help a storm intensify – such as warm ocean temperatures and favorable winds around the storm – will help the storm grow. The moisture of the air around the storms also seems to play a large role. Storms surrounded by dry air tend to be more compact, but storms surrounded by moist air tend to spread their rain bands out more, which can let the storm grow in size. That process spreads the high winds and heavy precipitation over a larger area, putting more people at risk. Hurricanes gain and lose strength, as well as change direction and speed as they move across the ocean. Why does that happen? Given enough time and favorable conditions, hurricanes will usually gradually intensify as the eyewall organizes into its characteristic circle. Moving over particularly warm water, like the central Gulf of Mexico, often gives storms an additional boost. Sometimes storms that have everything going for them will weaken and, with enough time, re-strengthen because of changes happening in the hurricane eyewall. Why hurricanes gain and lose strength – especially when they do so suddenly, like Michael – is something we are still working to understand better. Where storms go and how fast they move is determined mostly by the flow of the atmosphere around the storm. This flow includes the behavior of the jet stream and the movement of the same high and low pressure systems that bring us changes in our weather. We call this atmospheric flow the “steering flow” because hurricanes largely follow where the wind takes them. Should we expect to continue to see monster-sized storms like this in the future? Although storms of this size and strength do not come around often, they do happen and we can expect them to happen again. There is not a good way to know when the next storm of this size would hit the United States or where it would go. What role does climate change play in any of these factors? One way climate change can play a role is through rising ocean temperatures. Hurricanes rely on warm ocean temperatures for their energy, so as ocean temperatures rise, it is possible that the strength of the hurricanes that we see will also increase. Hurricanes are also massive rain generators. Recent research suggests that the speed at which hurricanes move may change in the future, and that hurricanes may produce rain that is even more torrential. As we saw with hurricanes Harvey and Florence, slow-moving storms can be lethal even when the storm is relatively weak, because all of that torrential rain falling in one place leads to flooding. However, climate change is complicated when it comes to hurricanes. Changes in atmospheric behavior, both where hurricanes form and where they travel, will play a role in how hurricanes respond. To reach Deanna Hence, call 217-244-6014; dhence@illinois.edu.